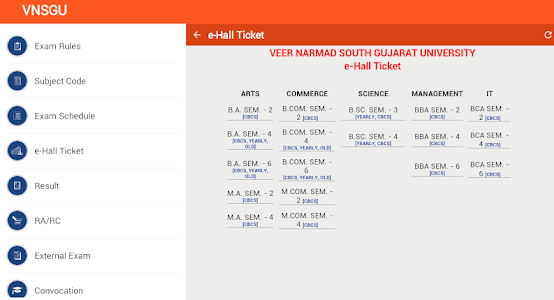 VNSGU e-Hall Ticket 2018 – Veer Narmad South Gujarat University – VNSGU official website is not responding right now, otherwise, exact link to download the Hall Ticket can be checked here as – http://vnsgu.ac.in/vnsguexam/schedule.php. Veer Narmad South Gujarat University is going to conduct the semester examinations in October, November and December Months. Following which, Hall Tickets for those tests will be uploaded on the official website of VNSGU soon. As, the authorised portal has clearly mentioned that e-Hall Ticket-2018 [OCT – NOV] E-HALL TICKET AVAILABLE FOR COURSES BA, BCOM, BSC, BBA, BCA, MA, MCOM, BED, MED, LLB, LLM AND BCOM/MCOM (HONORS). Course names and semester names for which e-Hall Ticket will be made available are – ARTS COMMERCE SCIENCE MANAGEMENT EDUCATION-LAW HOMEO. & MEDI. COMP. SCIENCE & IT RURAL STUD. & ARCH. • BA SEM-1 • FY BA (EXTERNAL) • MA SEM-1 • BA SEM-2 • SY BA (EXTERNAL) • MA SEM-2 • BA SEM-3 • TY BA (EXTERNAL) • MA SEM-3 • BA SEM-4 • MA SEM-3 (EXTERNAL) • BA SEM-5 • MA SEM-4 (CBCS). This state university Veer Narmad South Gujarat University located mainly in Suraj, Gujarat offers the courses in Under Graduate, Post Graduate, Integrated and PhD areas.